Free Pattern : Pumpkin Crocheted Pincushion! | CraftyGirl Creates CraftyGirl Creates: Free Pattern : Pumpkin Crocheted Pincushion! Home » crochet pattern » fall crafts » favecrafts » free » free crochet pattern » free pattern » pattern » pumpkin » Free Pattern : Pumpkin Crocheted Pincushion! 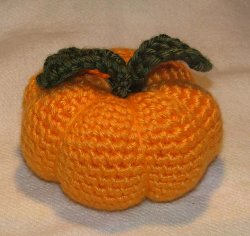 As I was browsing online for patterns today, I came across this adorable pattern for a Pumpkin Crocheted Pincushion. Isn't it cute? :) I think it would be great for a fall themed present!